We are a trustworthy organisation in offering a wide gamut ofPlastic Re-Process Machine. We are a trustworthy organisation in offering a wide gamut ofPlastic Twine Or Sutli Making Machine. 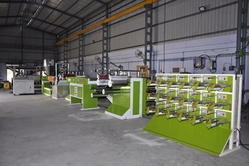 Altra Plastic Sutli (String ) Extrusion Plant. Sutli is commonly used term in India for Ropes or Synthetic Strings which is commonly used in Packaging of Local Market. Earlier there was Jute made sutli was used however with increase in demand and the Price factor Plastic Sutli is been today the most used in packaging of Local Market Articles . The best part of Sutli is that 90 % of Stuli is Manufactured from Re-Processed Granules of Polypropylene (PP) . In the time where globally we facing challenges of Global Warming its one of the best way where in used Plastic is recycled and Utilized in the best form .There are two kinds of Sutli manufactured normal and Fibrillated or Could be know as Twine . There few Changes in Machine in order to manufacture the different kind of sutli . A normal Sutli is Manufactured with the Re-Processed Granules which has Extruder and Certainly the Screw Barrel is designed for using Re-Process Granules with hydraulic Screen Changer for the Filtration Process and then it goes through a "T" Die in which a Sheet if Formed and then it goes to the first Godet where the first part is slitting unit Attached and its function is to cut to the number of lines and Thickness that has to be manufactured .Here the Machine consist of total 2 Godet units , a hot plate in order to Stretch the Sutli and then it gets Winded . For Fabrillation Sutli the Extruder and Slitting Parts Remains the same however at the second godet there is Fabrillation unit which twines the plastic to form Sutli Rope . Here we need to Understand that for both kind of Sutli has Different Winders and as Well the Number of Winding Station is Depending upon the Production capacity of the Plant . We could supply machine with Maximum of 90 Kg per hour for Production for the Sutli Making Machine . This Sutli is used in all kind of Paper Industry like Manufacturing of Books or Bundling of Items , Stationery Stores in order to bundle papers, file , or number of articles to be attached . It also used by the Plastic Processing Industry where carry bags are manufactured to bundle the number of sets to packed , plastic printed rolls to attached with paper on it , Stretch Film Rolls , Re-Process of Plastic to hold a bale , Plastic PVC Pipes , HDPE pipes to be bundle and Garden Pipes to be packed etc . 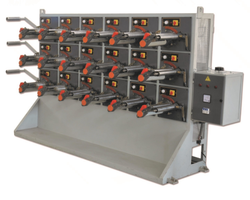 We ensure that this machine are Manufactured in the best form as its mass production line so we ensure that Screw and Barrel has good life with best Winding to provide the best quality out of it . We at Leena Extrusion ensure that there necessary additional equipments provided for free flow Operations .